It's Saturday and a new month - so we have a new challenge and a new hostess at the Crazy4Challenges Blog. 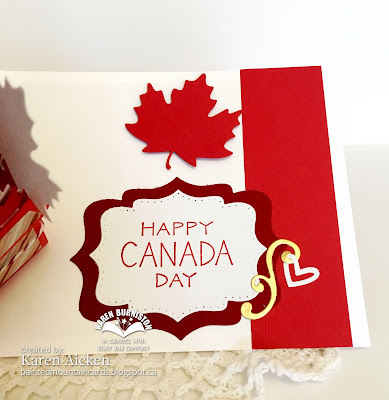 Maryann Einam will be our hostess with Kristine Reynolds joining us as our Guest Designer all month. You can see Kristine's blog HERE. 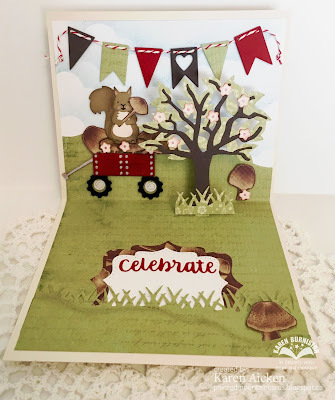 Here is Maryann's challenge "According to the Days of the year calendar today is Hop a Park day - using stamps or dies or both create a scene or something that you may see in a park". Since the challenge falls on Canada Day, I had to make a Canada Day card! This is our 150th Birthday, and there will be picnics, BBQ's, parties and celebrations in parks all over the country today. 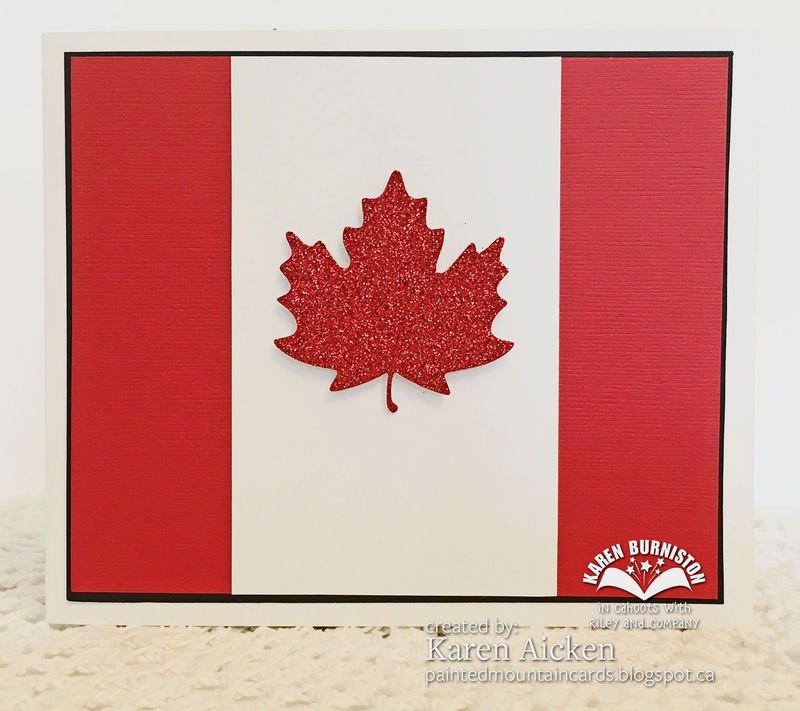 For the 'Canadian Flag' on the card front, I added a stitched Maple Leaf cut from red glitter card stock. I kept it simple, as all the fun is on the inside! ... and fully open. 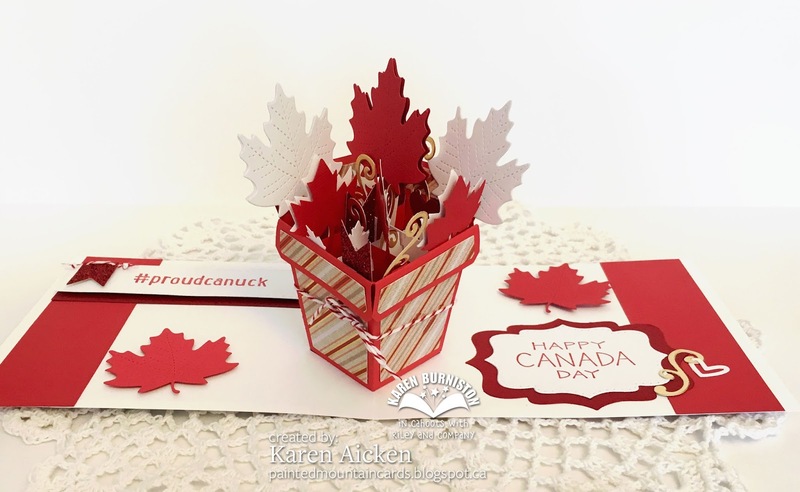 I used Karen Burniston's new Flower Pot Pop-Up die set, filling it with red and white Maple Leaves of various sizes, sparkly fish tail banners and gold foil flourishes. Both of these stamps I've had for a couple of years - I found them in one of the bins at Michaels and knew I'd get good use out of them. Check out the C4C blog to see how the Crazies have been inspired by the challenge. We'd love to see your take on it, so be sure to stop by the Crazy 4 Challenges blog and link up your creations. If you are uploading to an online gallery, please use the keyword C4C392. Small leaf punch - ? I woke up one morning and this idea just hit me as I was getting dressed so I headed straight to the craft room to get it made. I used the Charm Accordion, one of the new releases from Karen Burniston. I really like that it cuts two pages at a time! Below is the accordion in the closed position. Here is the table top decoration fully open. 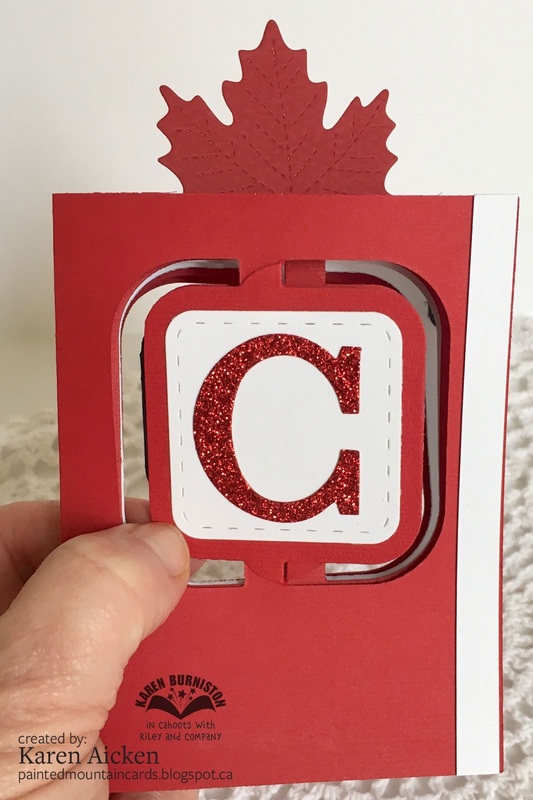 I used an old Stampin' Up die to cut the letters out of red glitter card stock, and the dangling heart charms are also cut from the same glitter card stock. One of the coolest dies in this set is the JUMP RING DIE! It cuts 4 jump rings at a time, and having them cut from card stock etc makes it much easier to assemble than using actual jump rings. 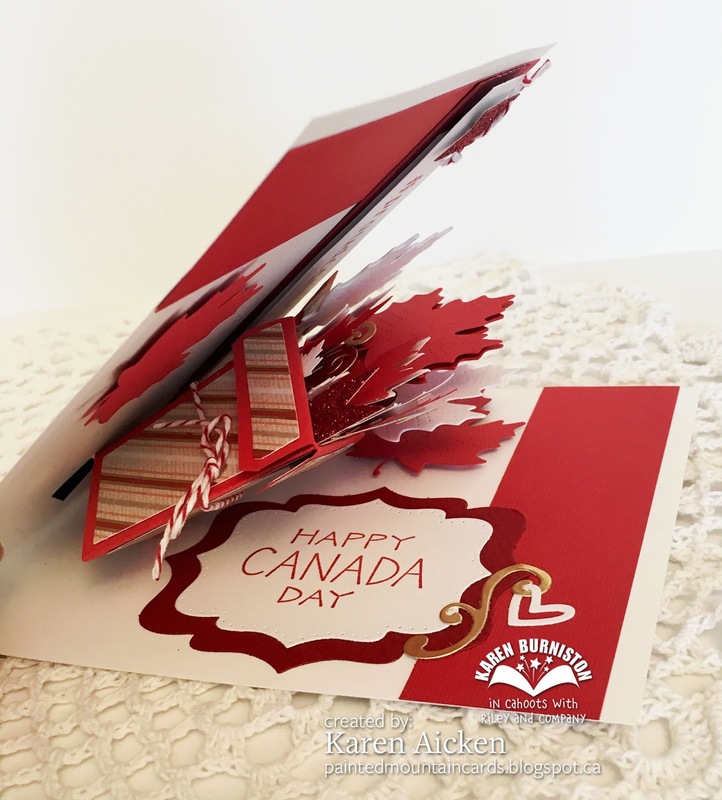 And not just for me - I see that comment a lot from people who have also purchased Karen Burniston's Charm Accordion. For this accordion, I cut the jump rings from gold Shimmer Sheets. When open, the decoration is a full 15" wide! It was fun choosing the different words to add from Karen B's new collection - I think the font is so sweet. These ones were cut from card stock with Xyron adhesive on the back which essentially turned them into stickers so they were easy to adhere. I cut the Charm Accordion three times, twice from red and once from white. The hinges (the hinge die comes with the Charm Accordion) were cut from black and they are what holds the panels together. I also cut the Charm Frames (included) from black card stock. Look at how flat it all folds up! Hubby was surprised and impressed at that - in fact, he quite liked the whole project! 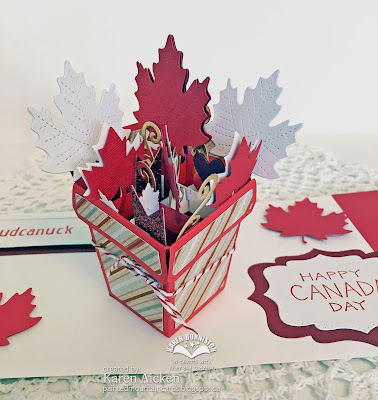 I'll be able to store it for other July 1st Canada Day celebrations as well. 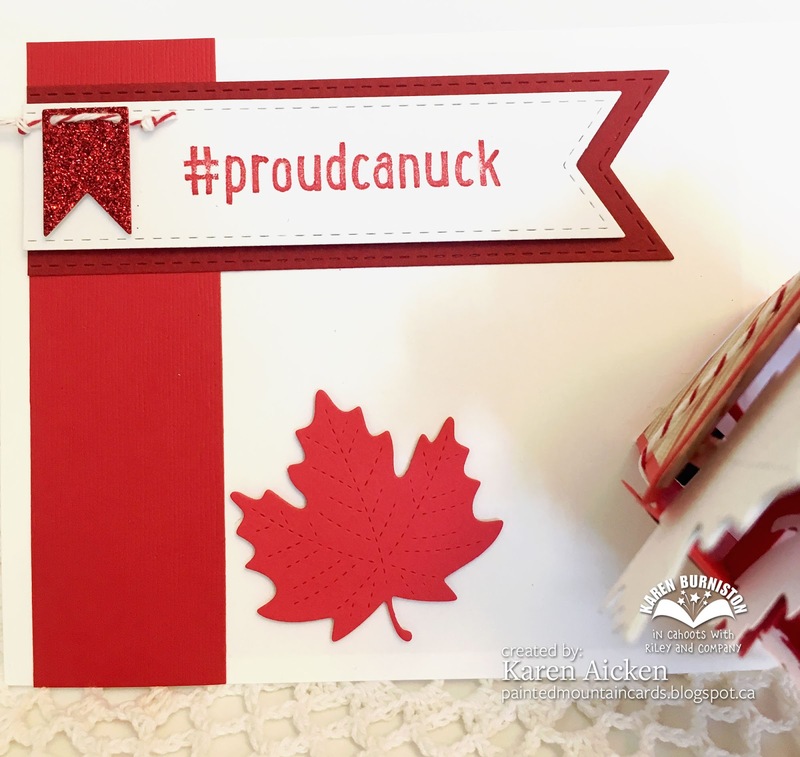 Canada is turning 150 this year, but I didn't add any numbers so I can put this out again next year. I made this card back in the early Spring when we were in Arizona. I am an early riser, but don't like to take the dogs outside until after 8am because of barking. So I got in the habit of getting up and leaving the dogs snoozing with hubby while I played in the craft room until 8am. Then I'd go get the dogs their breakfast and get them outside. I really enjoyed those mornings of solitude, with Netflix on my little iPad, sun shining and birds singing. What a great way to start a morning! I didn't have a plan for this one, but the patterned paper stack was out from a different project and I just started playing and layering. LOVING these cactus and succulent dies from the Stamps of Life. They hit my Wish List the moment they were released to the club members, but I had to wait until near the end of the month when they were available to the rest of us. I really like the soft colours in this paper stack. It's about 3 years old now and I still have lots left! 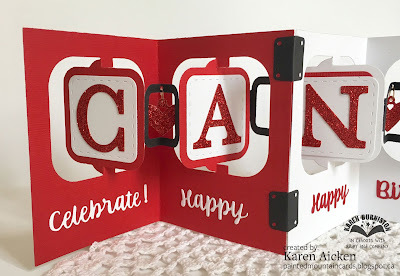 Today's share is a Pop-Up Birthday card using a bunch of new dies by Karen Burniston. 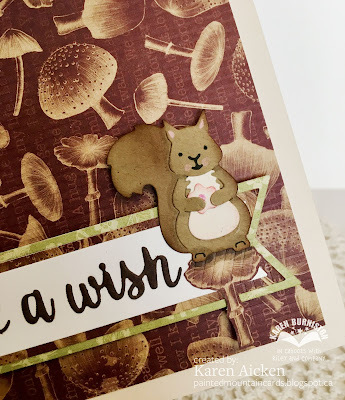 I've had the patterned paper for several years and I think it is going to work really well with the new Woodland Animals. Here, the squirrel is holding a die cut flower while standing on a fussy cut mushroom. Inside, I made a Pop-Up with the new Tree Pop-Up. 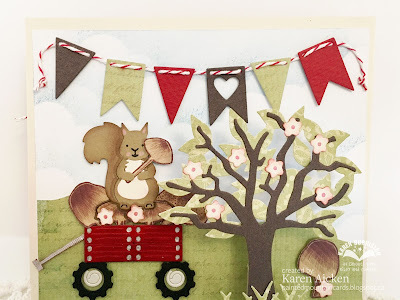 The greenery on the tree is cut with one pass so you can quickly make a full tree - or even lots of trees! I'm kind of proud of the wagon, which was made with the swing from the Tree Pop-Up. I cut four swings from red card stock and embossed the wood grain on them using the emboss feature of the die. They were adhered to a scrap of red card stock in behind, then I added the tire swing for wheels. The hubcaps were made with the jump-ring die from the Charm Accordion - I left the centre intact and adhered the whole thing inside the tires. The wagon handle was hand cut from a scrap of red card stock with markings from a silver Sharpie marker. The little squirrel fits perfectly in the wagon, but here I have added some fussy cut mushrooms for him to hold and perch on. 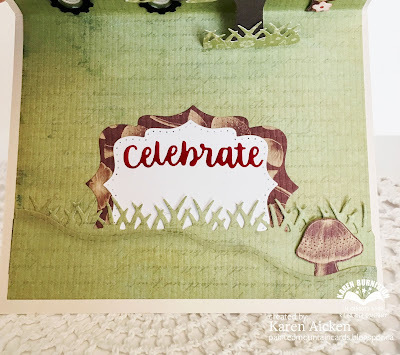 I used two of the three Nature Edges for the greenery, the ground/hill/snow/grass/dirt one and the grass is on the bottom part of the card with another fussy cut mushroom. 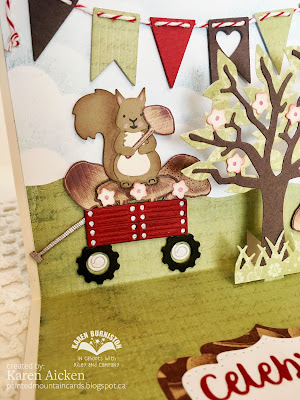 I decided to add a few flowers to the tree and wagon - the flower die cuts six at a time, so it doesn't take long to cut a whole bunch. I cut a stitched puffy cloud (Nature Edges) from scrap card stock, then used it as a stencil/mask with dye inks to create the puffy clouds in the sky. I hope you enjoyed this card as much as I enjoyed making it. 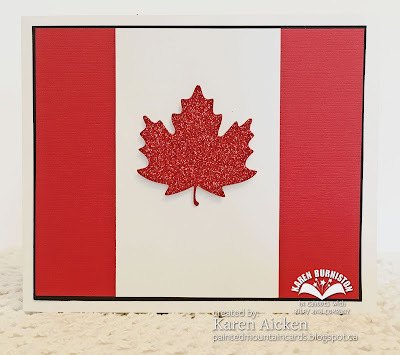 While I am in NO WAY trying to hurry through summer to get to Fall, I am thinking it will be fun to make autumn coloured leaves with this tree for Fall themed cards too. And bare, it will work great for Halloween! This is a card I made just for fun. I had some items on my stamping table (sunburst, cow, stitched circle) so I combined them to make a square card. The sunburst was actually the negative area from THIS card but I thought it could be used on it's own. The tree die actually cuts a tree on either side, but this time I only wanted a single tree. I added a second leafy bit behind the one to make it look like there are two trees on that side. A little hand lettering inside, along with a haystack and a pair of blue birds. Done! It's Masculine Card Monday here on my blog, and for my second post today I have a Birthday card to share using Karen Burniston's Hot Air Balloon die. 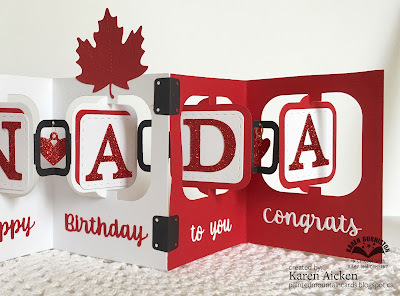 As you can see, it makes a great embellishment for a card in addition to a Pop-Up card. The papers were in my stash and I've had them for many years. Fun to break them out again. I embossed the white panel with a clouds embossing folder and lightly sponged blue on it so the raised edges would catch the ink. This card is going into my donation box for Seniors Secret Service. I had fun this past weekend making a Travellers Journal for our 6 year old Granddaughter Olivia. If you follow my blog, you know that she loves pink and purple and everything girlie. 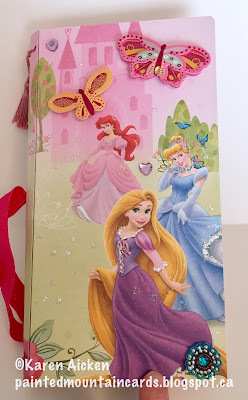 I've had this pad of Disney Princess paper since Children's Wish Foundation sent Olivia to Disney World so I got it out againfor her journal. I used Eileen Hull's Journal die to make the journal itself - it's from her Heartfelt Collection and it's AMAZING. The different ways people are using this die are nothing short of inspiring. It goes together perfectly, all the scoring is done and holes cut with the die. It's a BigZ Score Board die, which means it cuts matt board, chipboard etc. I used heavy chipboard for my covers, covered front and back with patterned paper and it still cut beautifully. Here is the front cover, embellished with lots of glitter glue, some purple heart gems (purple for Pulmonary Hypertension and hearts because of Olivia's big heart) and layered sparkly 3-d butterfly stickers. I added a mauve tassel and iridescent heart beads to the spine. You need to cut two covers - one for the front and one for the back. Then they adhere together with a strong adhesive. 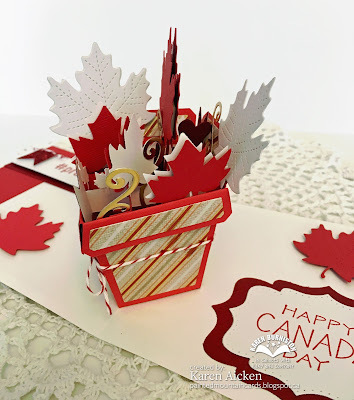 Since I use the Elizabeth Craft Designs double sided adhesive for my paper crafting, I used that on my first Travellers Journal. However it is NOT strong enough. I picked up red-line tape for this one. Here you can see that there are three signatures (inserts/booklets) inside the journal. This is the cover flattened out so you can see the front and back. I chose a wide, pink sparkly elastic to close the journal ... the end photo shows it closed with the elastic. Here is the inside - there is a little bag with a window & transparency that I've tucked some iridescent rose stickers in and added some purple gems. Olivia can add other goodies to the bag as well. You can also see all three inserts as they fan out when the journal is opened. I added a punched tab to the top of each insert, staggered, with an iridescent gem on the front and a purple one on the back. The front cover of the insert has lots of sparkle and a fabric flower. Inside each insert, I added a flat paper bag with the bottom trimmed off and notches cut into the top and bottom. 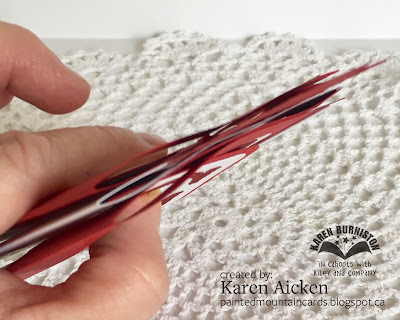 They are folded in half sideways and placed against the cover, so when the pages are added to the book the bag forms a pocket. There is one at the inside front cover and the other end is inside the back cover. I added sparkly washi tape to each end to decorate them up a little. Olivia can doodle or write on the bags as well. Inside each of the bag/pockets there are 4 x 6 patterned paper pieces that Olivia can write secrets or special things on, and a small sheet of washi stickers. I added a sheet of patterned paper to each of the inserts as well. This first insert has quad paper inside that Olivia can use for practicing her writing. I also stamped each of the pages and she can colour the images in or draw around them. Below you see the back of the first insert and the front of the second. There is another tab with gems at the top, lots of glitter and another 3-d sparkly butterfly sticker. I stamped a few images throughout this book as well, but the pages are sketchbook paper so Olivia can use this one for drawing in. ... and here you see another bag/pocket. The Disney patterned paper is double sided so there are sweet patterns inside the covers as well. 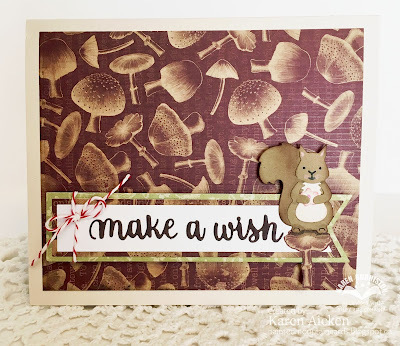 This third insert has a combination of sketch paper and quad paper. I added iridescent rose stickers throughout this one. Below is the back of the third insert and the back cover of the journal. Finally, here is the journal with the elastic closure. It's not too tight so little fingers will be able to slide it off and on easily. This must seem like a lot of work to do for a 6 year old, but with the amount of time Olivia has to spend at the Children's Hospital I think she will get a lot of use out of it. It will easily fit in her backpack too. I may look for some small gel pens to go with the Travellers Journal and add a pen-loop. But for now, I'm calling it done! 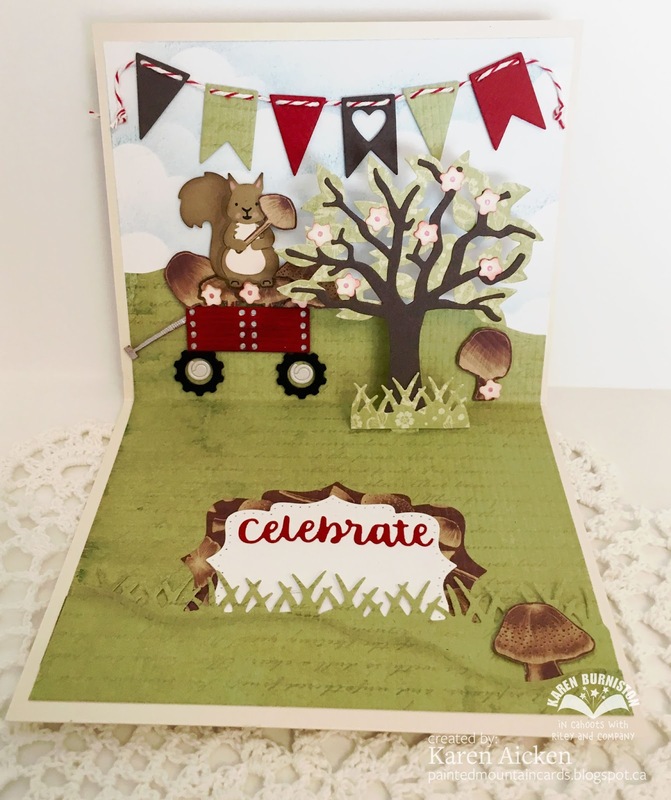 Today is the last day of Farm Week here on my blog - I had so much fun creating this Farm themed card set for our daughter on Mother's Day. So much fun - I got to use some of my new goodies as well as some older products that needed some love. Win win! 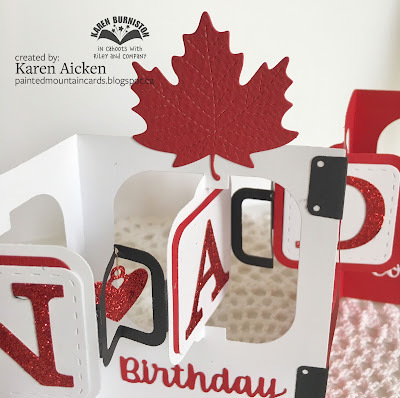 Inside is a Pop-Up, using Karen Burniston's older Pop 'n Cut dies. This 'Love' insert is going to get a ton of use. I love how it pairs here, with the Sending (Love), Hogs & Kisses. The little heart on the front, is the centre that falls away when you cut the LOVE die inside. I know. 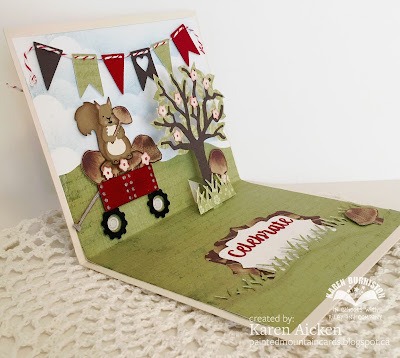 I stacked a lot of die cut farm critters on these cards ... but really, they look so cute stacked. Our daughter loved her cards. She said she didn't think she would be able to send them to anyone until she had coveted them for awhile. Ha - she is my daughter all right.